Telecommunications most patronised youth offering, MTN Pulse, is set to activate its online campaign, today, in a bid to delight its over 7 million youth community, across Nigeria. The platform will give youths the opportunity to explore their freedom and share images of their passionate, fun-filled and pulsating moments with friends, via the social networks, like tweeter, to have a chance to win fabulous prizes. With designated locations in Lagos, Port Harcourt and Calabar, set to have a feel of the pulsating moments, every Nigerian youth will also have the chance to tweet the pictures of their best grooving moments. The procedure is simple. To be part of the online gig with coolest ‘peeps’ in Nigeria today from 10pm, simply follow on Twitter @MTNNG and Facebook, MTN LoadedNG. Also to have a chance to win fabulous prizes, tweet and post a picture of yourself, wherever or however you are having fun and tag us. However, the tweeted image must end with #OnaPulsingP. The tweeted or posted picture with highest number of retweets or Facebook ‘likes’ will win an MTN BBZ10 and lots of other fantastic consolation prizes to go. It is on record that MTN Pulse has been the preferred choice for Nigerian youths since it was launched in 2012. The offering gives subscribers access to free weekly data for endless chat with friends and to browse the internet on mobile phones. It also offers a cheap call rate at 8.34Kobo per second. However, MTN, Africa’s largest telecommunications network provider, is cementing its position as the number one telecommunications service provider, in Nigeria, as well as the most consumer-sensitive company in the industry. 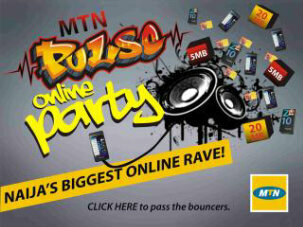 MTN Pulse, therefore, is one of the company’s ways of taking consumers to the ‘new world’ in the 21st century. Good News to All MTN Blackberry Subscribers!!!! MTN NG New Data Rollover & Auto-renewal.